Paydirt! Video Slot Review - Casino Answers! Paydirt! is a 5-reel, 25-line video slot developed by Realtime Gaming, featuring stacked wild symbols, scatter wins, multipliers, three free spins features, a bonus game and a progressive jackpot. You can play the Paydirt Real-Series Video Slot at Bovada. Bets on the Paydirt slot machine are $0.01, $0.02, $0.03, $0.04, $0.05, $0.06, $0.07, $0.08, $0.09, $0.10, $0.25, $0.50, $1, $2.50 and $5 per line. You can select from 1-25 paylines on the Paydirt slot game. You can bet anywhere from a penny up to $125 on the Paydirt video slot. Paydirt has a good betting range that is suitable for casual players and high rollers. You can manually skill stop Paydirt’s reels by pressing the “Stop” button in the middle of any spin you make. To play the Paydirt video slot, select your bet and press the “Spin” button. 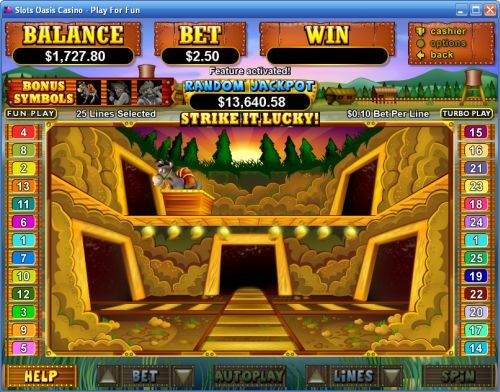 The highest paying symbol on the Paydirt online slot game is the Mine Entrance symbol. If you land 5 Mine Entrance symbols on a selected payline, you can win the 10,000 coin top jackpot. Other high paying symbols are the Miner (2500 coins) and Bandit (3000 coins) symbols. When a Gold Nugget symbol substitutes in these winning combinations, they can be tripled to 30,000 coins, 7500 coins or 3000 coins respectively. Paydirt features a progressive jackpot. It is randomly triggered, so any spin you make can strike gold. At the moment, the Paydirt progressive jackpot is at $13,670 and rising very fast. Before this progressive jackpot collapses, we recommend you try and win it today over at Bovada! 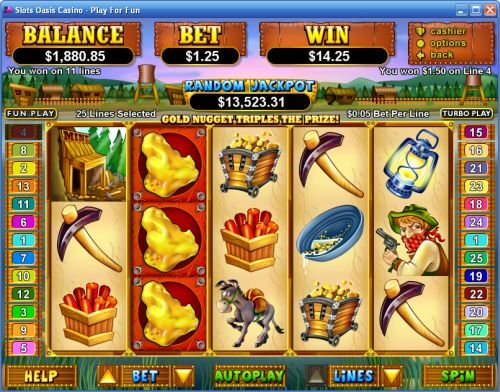 The Gold Nugget is a stacked wild symbol that only appears on reels 2 and 4 during the regular slot game. It will substitute for all symbols in Paydirt except for the Scattered Sign symbol. The prize is tripled when one or more Gold Nugget wild symbol substitutes in a winning combination. Hit the “Autoplay” button to open the autoplay settings. You will be able to set the number of spins, set it to stop when the jackpot is won, stop if a win exceeds or equals (any amount you input), stop on any win, stop if your balance increases/decreases by any amount you input and stop once the feature is triggered. You can stop Paydirt’s autoplay mode using the “Stop Auto” button to deactivate it. As you can usually expect from RTG, Paydirt is an amazing video slot. It has a fun theme that suits gambling online and gets you in the mood to win some gold for yourself. Its wild symbol is a big winner that will lead to some huge wins. The progressive jackpot also makes things more exciting because you never know when you might hit it. Paydirt also has three different special features, all of which are very good to excellent. You can play the Paydirt video slot when you sign up and make a deposit at Bovada! Where can players from the United States of America play the Paydirt online slot? Americans are most welcome to play the Paydirt slot game at Bovada. For more casinos that host the Paydirt slot machine, please read our list of RTG online casinos. Isn’t Pay Dirt at Vegas Tech online casinos as well? No, that is a different progressive jackpot slot. For more on that slot game, please read our Pay Dirt Progressive Jackpot Slot Review.